Preheat oven to 375º and coat the muffin tin or ramekins with cooking spray. Lightly flour a work surface. Using a large glass, cut pie crust into rounds for ramekins. Place pie crust in each cup and gently press down. Bake until lightly golden (6 to 8 min). Heat broiler. Meanwhile, make beef mixture in a large skillet over medium heat, heat oil. Add onion, carrots, and garlic and cook until softened (5 min). Add ground beef and cook until no longer pink (6 min). Stir in frozen peas and corn and cook until warmed through (3 min). Move mixture to one side of skillet and melt butter in empty side. Add flour and whisk until combined and golden, 1 minute, then pour in beef broth. Combine with mixture and cook until thickened (3 min). 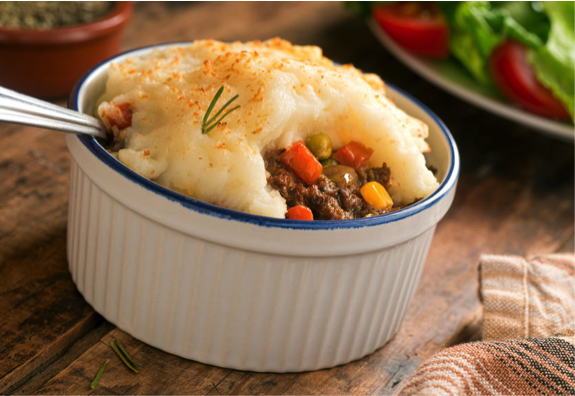 Fill baked pie crusts with ground beef mixture and top with a big spoonful of mashed potatoes. Broil until golden (5 min).